Winter Wonders 2012 (Plaisirs D'hiver) festival was one of the major attractions in the centre of Brussels this Christmas. Thousands of people took leisurely strolls along the festive route between Place Saint-Jean and Marché au Poissons in a welcoming, dazzling and magical atmosphere typical of festivals at this time of year. The illuminated and sound-filled setting featured a wide range of fun activities (including street theater, ice skating, music bands, and puppets etc. ), as well as several large digital signage solutions. The Christmas holidays are also an important time for many businesses who rely on the busy trade to boost profits before the end of the year. And this year at the Winter Wonders festival, Christmas shoppers were also greeted by several spectacular LED walls installed before the holiday rush to boost trade advertising and public information and entertainment. These LED Walls were provided just in time for the holidays by IDklic, a Belgian company specialized in Digital media, and a full-service provider for digital signage solutions, they managed and distributed the content on the LED walls. As an advertising agency, content producer and technological partner, they operate the most extensive and effective digital signage network in Belgium. Based in Brussels, iDklic works with retailers, pharmacies, government agencies, and other consumer-facing businesses in order to increase sales and value. IDklic’s goal is to maximize Return on Investment (ROI) by building a successful digital marketing solution. 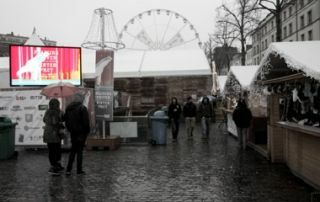 During the holiday period the Plaisirs D’hiver location was transformed into a Christmas winter market, and they needed content to be displayed which was a mixture of festival information and advertising. In addition, the screens were also going to be used to display important information to help guide visitors around the event and find help in case of an emergency. For this purpose cost-effective LED wall displays, which are designed for brightly lit environments, needed to be manufactured and installed. The LED Wall displays located around the site needed to be constantly connected with the IDklic server to rapidly be able to upload content, and for controlling the system reliable 3G communication was necessary. One of the main reasons why service providers fail with their LED video walls, is because during an event the LED Wall starts to go wrong and shuts down randomly, leaving the public disappointed and the organizers angry. So, one of the primary goals was to improve the accuracy of the messages to be displayed. Key points were total reliability in communication, GPU performance, ability to remotely control the players, and robust and wide temperature resistant operation. To meet these demands IDklic chose Advantech's ARK-DS520L-D6A1E advanced digital signage platform, with a EWM-C106FT01E Mini PCIe Card 3G module inside. Each player was connected 24/7 to the IDKlic server by a 3G connection so the customer had a dedicated communication path to control and modify the content to be displayed. One of the key reasons they choose the ARK-DS520L was because of the capability to insert extension modules like WIFI, and in this case a powerful 3G module. The integrated NVIDIA GT218 (ION2) graphic module inside gives a strong graphic performance and in combination with the Intel® Atom™ D525 processor makes it a perfect cost / performance combination. Another key value that made them choose this solution was that highly robustness of the player and it came supplied with embedded tools like SUSIAccess for easy and remote maintenance and control. The result was a powerful, live, remote controlled LED Wall solution. With these outdoor displays the Christmas shoppers could watch and enjoy all the events and activities, and commercial customers could reach the wider public through their seasonal advertising. Every day, thousands of people past through the area to enjoy the Christmas activities and were kept up to date through the dazzling displays.